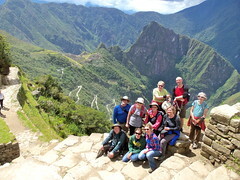 After hiking around Machu Picchu and a day of rest and travel, I think we all realized just how exhausted we were. 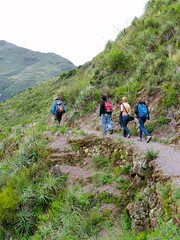 However, that didn’t stop us from hiking around Písac and climbing still more stairs. 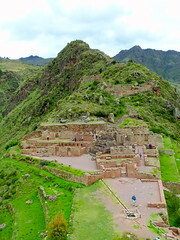 Písac is the site of Incan ruins that includes agricultural terraces, a citadel, a sun temple, and an astrological observatory. 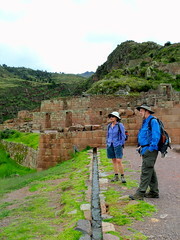 We hiked along the side of a large hill overlooking the Sacred Valley and the city of Písac in order to climb up to the Temple of the Sun. 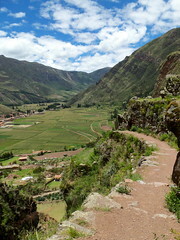 Once there, we had a panoramic view of the Urubamba River, which cuts through the valley along with many Incan terraces that are still in use today. Afterwards, we descended into the valley by route of time-worn, steep stairways but were rewarded at the bottom as we got to stroll through the famous Písac market to browse the local products. Video produced by Megan Roltgen. Photos by Brita Dallmann, Megan Roltgen and Lacey Weninger. 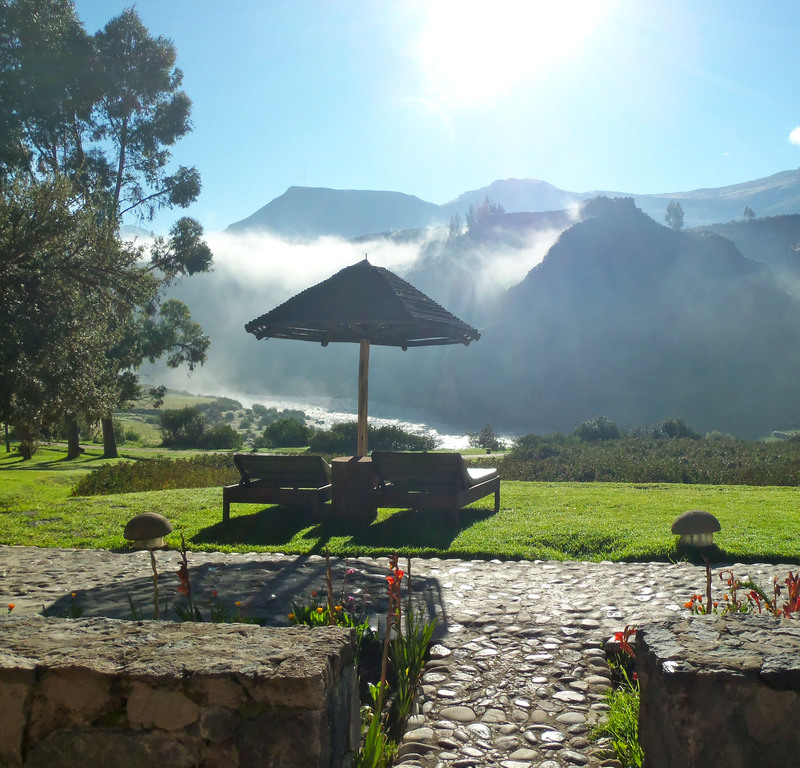 The early morning mist rises off of the Colca River. Photo by Megan Roltgen. Have you ever gone on a tour of a place? Did you find yourself reflecting upon it later and wondering how the local people view it? Do they agree with the general script the tour guide fed you? Or do they have their own stories and memories to share? Brita, Lacey and I sat down to talk to a member of the waitstaff, Antonio, at the lodge we stayed at in the Colca Canyon and listened to his account of growing up in the region. Antonio was born in a tiny town in the valley but went to Arequipa when he was 9 years old to go to school. As he got older he studied hostelería, which prepares students to work in hotel and catering management. When he was 19 he returned to Colca and found a job in a hotel and has been working hard ever since. 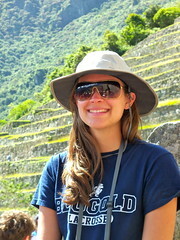 He began his job at the Colca Lodge in 2004 and was recently able to purchase 2 hectares of land for himself. His wife, Lucía, is able to work the land and take care of their animals while Antonio works at the hotel. 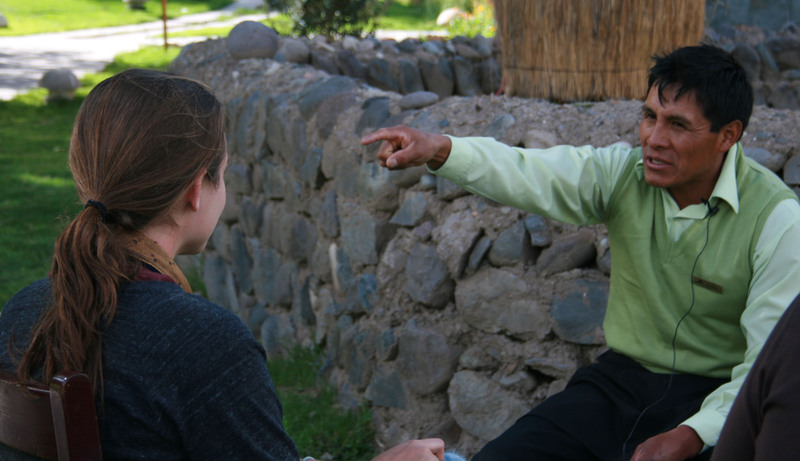 Lacey spoke with Antonio one afternoon during his break at the Colca Lodge. Photo by Brita Dallmann. Antonio has dreamt of opening his own restaurant for as long as he can remember, and thanks to his job at the lodge he has finally saved enough to start the process. If all goes as planned, Antonio will be serving up delicious meals to the citizens and visitors of Chivay, a larger town in the canyon, by next year. Not many people can say that they’ve chatted with the locals in such an intimate manner, but we are glad that Antonio and many others along the way were willing to share their stories with us. Watch for a full story including video from our interview with Antonio on our website, which will be debuting later this semester! 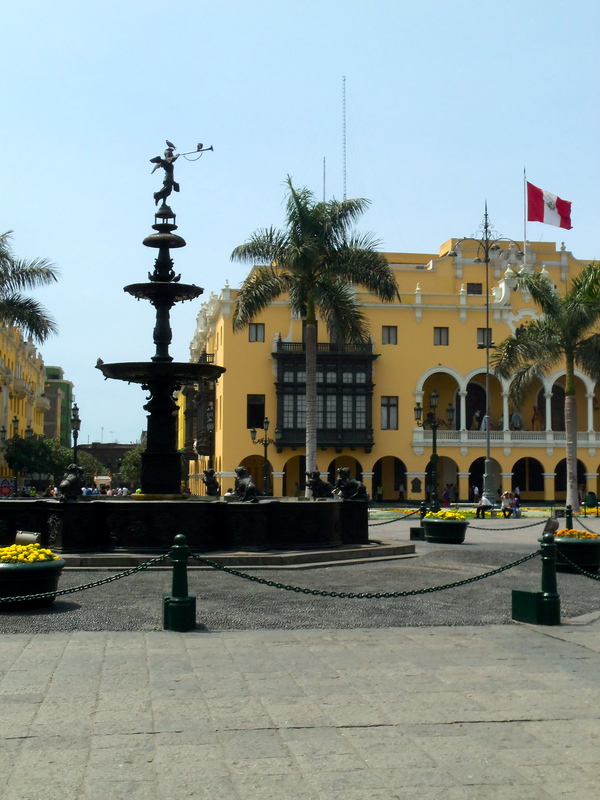 Centro, as los limeños refer to the downtown area, is home to many of the historic buildings in Lima, although the majority are not the original buildings that the Spanish built after Francisco Pizarro founded the capital city of Peru in 1535. On Sunday, Melanie picked us up from our hostel in a van and pointed out various buildings and neighborhoods along the way. Our first stop was in the Plaza San Martín which honors José de San Martín who played a large part in liberating South American territories from their respective rulers across the ocean and helped Peru declare its independence from Spain in 1821. From there Melanie led us to the Plaza Mayor, which is surrounded by the government palace, the municipal palace and a cathedral. All of these buildings have been reconstructed because earthquakes severely damaged them throughout Lima’s history, but the original doorway of the cathedral has survived the test of time. One interesting thing Melanie told us is that all government-owned buildings in Lima must be painted on a regular basis as required by law to keep them maintained. Different buildings are painted various colors; those surrounding the Plaza Mayor are a vibrant yellow while those surrounding the Plaza San Martín are white. We also saw blue and red buildings surrounding other plazas. Making our way through the shantytown. After strolling past a few more historic buildings, we found a bus that would take us to the top of the San Cristobal hill, the highest point of the city, to get a panoramic view. 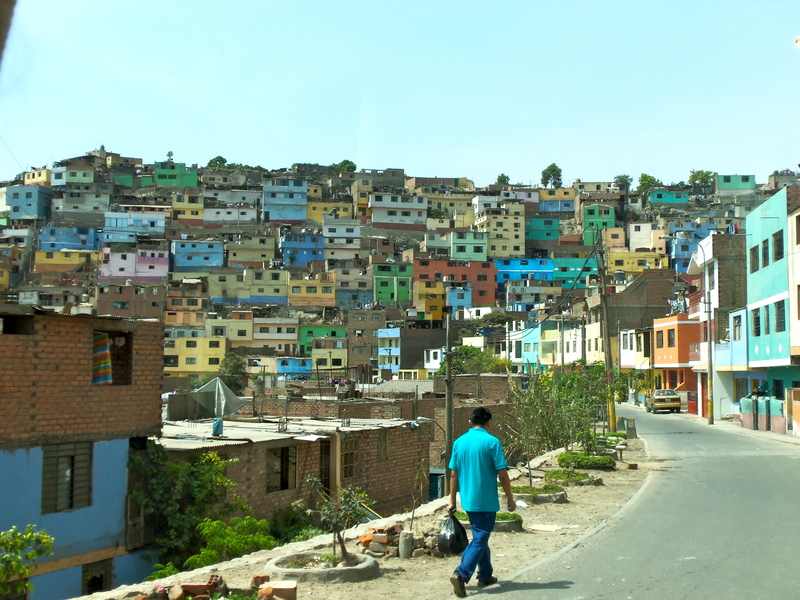 Our bus wound through a large shantytown before climbing the steep hill. 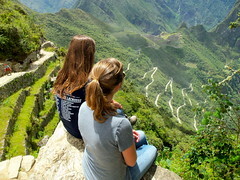 The road that leads up to the top is only one lane wide and has a very steep drop off. Needless to say a few of us had to cover our eyes as we made our way up. We made it to the top and spent a half hour looking around, chatting with Melanie, and waiting for the next shuttle to come. The ride down was just as scary as the ride up. At one point our bus encountered an oncoming taxi and I’m pretty sure the whole bus was only centimeters from plunging down the side of the hill. If you think I’m exaggerating, watch Mike’s video of part of the ride down. We all let out a sigh of relief when we found ourselves at the bottom again. After lunch, Melanie took us to meet Humberto who will be helping Melanie lead our tour, and we ate gelato with him and his family. 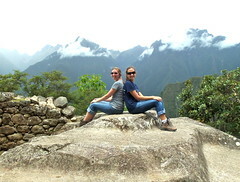 It was a lovely way to start off our adventures in Peru! 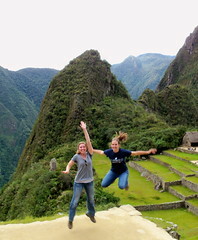 That’s approximately the number of miles we logged to arrive in Lima, Peru on December 31, 2011. As Equipo Peru united in the aeropuerto from our respective points of origin, we gathered around the baggage claim just in time to ring in 2012. Haggard, and eager to relax at our hostel, we scrutinized the collection of maletas waiting for ours to appear. We (Brita, Lacey and Megan) found our bags quickly but as the luggage circled around and around and around we realized that Mike’s and Sharon’s bags might not have made it on the plane from Houston to Lima. They’d been delayed in Minneapolis due to fog in Houston and arrived only about an hour before their flight to Lima departed. What a way to start the New Year – in Lima with only their small carry on bags in hand and uncertain about when their bags would arrive. After Mike and Sharon gave the airline the address of our hostal and contact information for each of them we headed to the exit hoping that the van our hostel had sent for us hadn’t given up on our arrival. Luckily we found the driver and he led all five of us to our awaiting chariot. Now, of course we weren’t expecting a chariot but we had informed the hostel that there would be five people and that we would all (presumably) have large bags and carry on luggage. What we found was a small auto that resembled a station wagon and had enough seats for four passengers. At least Mike and Sharon didn’t have large bags, but this was still shaping up to be a very cramped, 40-minute car ride from the airport to our hostel. Our driver seemed to have a better idea and just disappeared while we tried to figure out how to cram into this tiny car. Little did we know that he had gone to recruit a second taxi. A few minutes later our driver appeared with another taxi right behind and we all let out a sigh of relief. Mike and Sharon went with the second driver while us girls stayed in the original taxi with our bags. 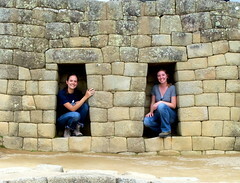 Megan was the only one who had been to Lima before so she knew what was about to happen, but the rest of Equipo Peru was in for a treat. The drivers in Lima don’t stop for anything. They just honk their horn as a warning to get out of the way or swerve into the next lane with what seem to be aggressive maneuvers. The adventure never ends in Sudamérica. Since it was el año nuevo, there were many people in the streets and fireworks lit up the sky in all directions. 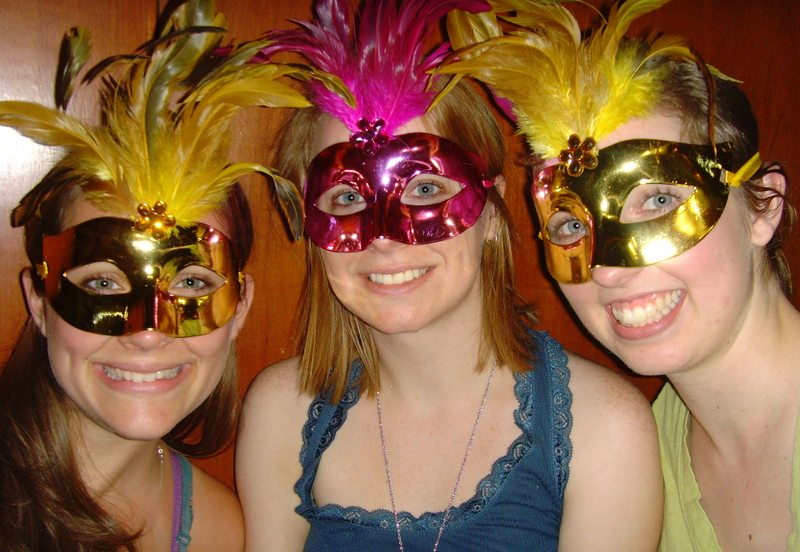 We donned masks to join the celebration. We passed along the beach and wound our way to Miraflores, the neighborhood where we will be staying for the week. Thankfully we made it safely to our hostel and were greeted by the owners and their family along with a few guests who were all celebrating the New Year together. They showed us to our room and invited us to join in the festivities after we dropped our luggage in the room. Us girls decided to go and mingle for a bit even though it was 1 a.m. and we’d all been awake for way too long while Mike and Sharon called it a night. The crowd was very welcoming and even though we could barely keep our eyes open we realized that the Peruvians celebrate New Years in a way very similar to ours; with family, music, and good conversation. As the party moved elsewhere, the three of us retreated to the sanctity and (relative) quiet of our quaint room and logged in some much needed Internet time before getting 4 hours of sleep to prepare for a full day of exploración limeña. Gestión chronicles the business and economic news of Peru. And, for something a little less newsy, there’s Perú21 that is more of a news blog. If you have any travel tips for us, please share them in the Comments section below! Director of KetzalCoatlicue, Susana de León, speaks to the audience about the group's traditional dress. First we heard the jingling of the shells on their ankles, then we saw their headdresses adorned with colorful feathers, and shortly after that the Aztec dance group appeared from behind the curtains dancing to the steady beat of the sacred drum. This past Friday I had the opportunity to attend the dance performance of an Aztec group from Minneapolis called KetzalCoatlicue. The group was featured during a series of events during Latin American Studies Week on the UWEC campus. The group’s director, Susana de León, and her troupe of six young dancers began the ceremony with an offering dance and went on to demonstrate various Aztec dances that have been passed on through oral tradition since their ancestors inhabited Mexico. León explained that each dance had a ceremonial purpose and that each of the dancers’ outfits were handmade by the dancers themselves. Each outfit is made of leather and embellished with feathers, shells and images related to stories passed on through oral tradition, and they are quite elaborate! 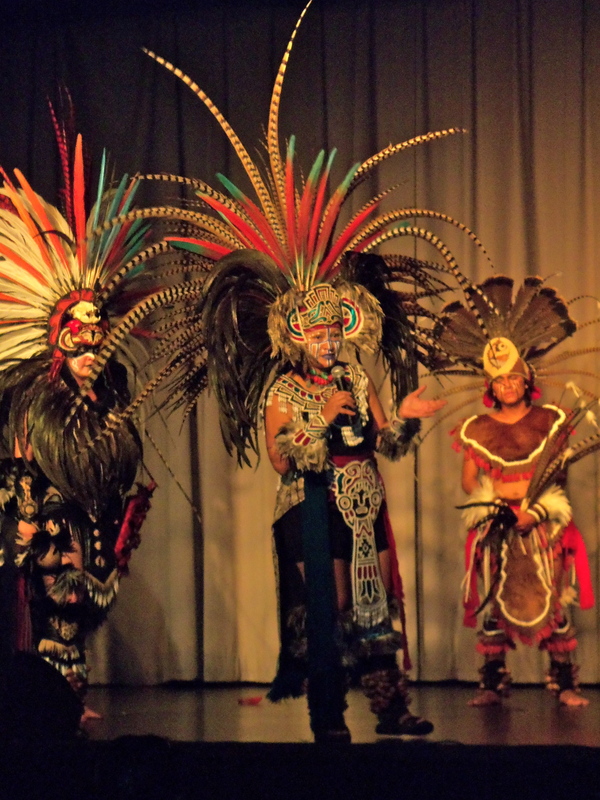 The volunteer members of KetzalCoatlicue travel around the country to perform for audiences and to keep the tradition of dance alive and educate people about the Aztec culture. About halfway through the performance, León invited audience members to join the group onstage and proceeded to teach them a short dance. As with the other dances, this dance included many quick steps and repeated series of steps, and she even tossed a few turns in there to spice it up a bit. Afterwards the group finished up their dances and ended the evening the same way they started, with an offering dance. Then the headdresses disappeared behind the curtains and the sound of the shells on their ankles subsided, leaving the audience in awe. The performance was full of youthful energy, and I suggest if you ever get the chance to see KetzalCoatlicue perform, you should definitely go. If you would like to read more about the group, visit their website at http://www.vfvaldez.com/kal/index.html. Have you ever attended a unique cultural performance? Share your individual experience in the Comments section below!